I love sourdough. Pure and simple. It helps break down the gluten in grain to make it easier to digest, and it has a wonderful flavor that can’t be beat. Did you think that sourdough was only for English muffins or bread? Well, we love to make it into sourdough pizza crust and it’s super-duper easy! Not only is the dough easier to digest, but sourdough pizza crust turns out much crisper than my old regular yeast pizza dough for some reason. Maybe it’s just me? Anyway, to make the sourdough pizza crust, your starter should have been fed in the last 12-24 hours. just fed sometime in the last 12 hours or so. 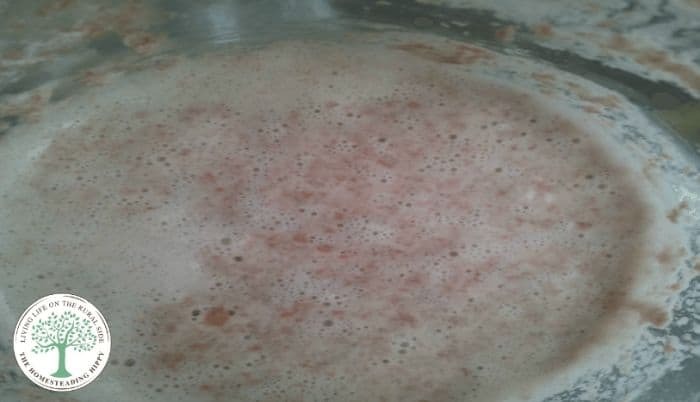 To get the dough going, take 1 cup of the starter and mix with 1/2 cup water. Add up to 1 cup of flour, in 1/4 cup increments. You want your dough to be a bit on the wet and sticky side at this point. Mix well, cover and allow to sour for 3-12 hours. I usually only go 3, because I am not organized enough to think ahead 12 hours, and my family is not as fond of the soury taste as I am. mix in 1 Tablespoon celtic salt, and 1/4 cup olive oil and mix well. You might have to get your hands in there to get it all mixed in. You can add 1/4 cup honey at this point as well, if you like your crust to be a bit “sweeter”. Sometimes I do this, just to make the kiddos happy. Roll out your crust on a oiled pizza pan or baking sheet and “dock” with a fork. This means making little holes all over the crust to allow air to flow through. Bake in a preheated 450° oven for 10 minutes. Remove the crust and add your toppings. Return to the oven for an additional 15-20 minutes until cheese is melted and bubbly. Allow to cool for 5 minutes before slicing. This lets the cheese, sauce and toppings “settle” and you won’t have as much of an issue losing them when you serve. Viola! 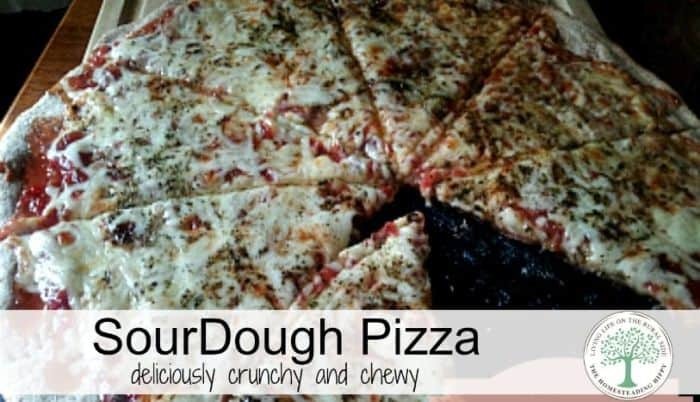 Sourdough pizza! Okay, I’ve been wanting to try to make sourdough for a while now and this recipe has me properly motivated now ~ gotta just do it! oh sweet mercy I miss sourdough! I need to try getting some gluten free starter going. my one year anniversary of reading gluten free is just around the corner, too. hoping I can handle wheat in this form after giving my body a break. your pizza looks sooooooooo good! Oh my goodness, I love you for posting this. I’m getting off the computer right now and going to go make some! Just made this tonight. It was delicious! I used my cast iron pizza pan and the crust turned out perfectly crispy. Thank you for sharing!